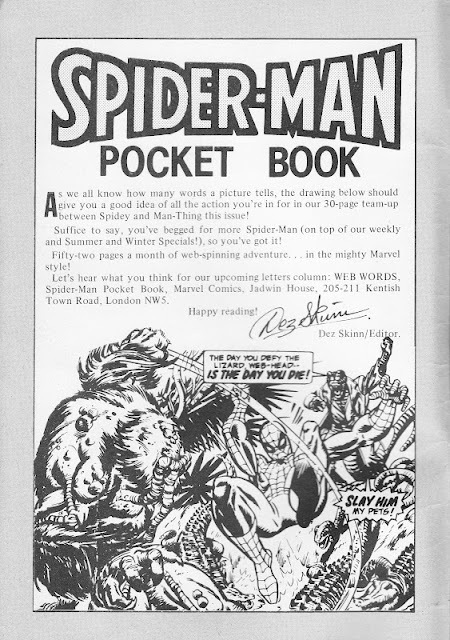 Back in 1980, as part of his Marvel Revolution Project, Marvel UK boss Dez Skinn was charged with increasing the Annex of Idea's output without devouring contemporary material at an even greater (and unsustainable - special UK strips were already being created by the New York mothership to fuel STAR WARS WEEKLY) rate. As with Skinn's seasonal specials (launched the previous year), Skinn also looked to his competitors for his next 'innovation': digests! 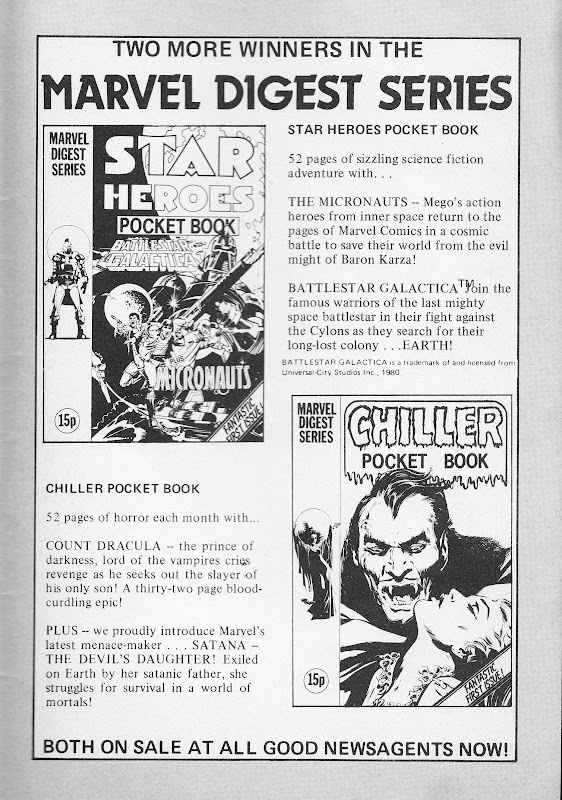 Rivals DC Thompson and IPC had been cranking-out their pocket library digests for years... considerably longer than Marvel's wannabes would last. Skinn believed their diminutive size would ensure newsagents placed them at the front of displays, ensuring maximum exposure. The bitter truth was that they were more likely to get lost in the sea of comics or racked adjacent to the more attractive (colour!) US imports. Marvel's oft-patchy distribution certainly didn't help. The A5, black and white, pocket book line largely exploited Marvel's sixties back catalogue with only CHILLER, STAR HEROES and, briefly, SPIDER-MAN running more recent material. The range (initially THE FABULOUS FANTASTIC FOUR, SPIDER-MAN, CHILLER and STAR HEROES) launched in March 1980 with a second wave (YOUNG ROMANCE, TITANS, THE INCREDIBLE HULK and CONAN THE BARBARIAN) launched in September. Several of the featured characters (The Hulk, Conan, Spider-man etc.) were already appearing elsewhere in the Marvel UK line-up: an early example of M-UK brand extension. 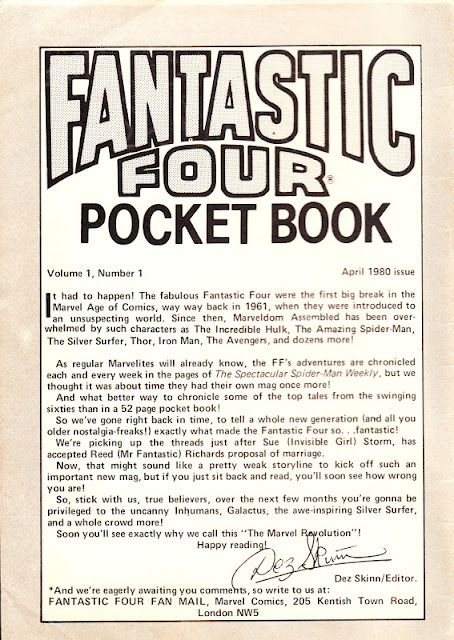 The first wave was heavily cross-promoted in the Pocket Books range and the wider Marvel line but the second range received much less publicity and, by 1981 (and the first raft of cancellations), Marvel's new management seemed to have lost interest in the digests with barely an editorial nod. 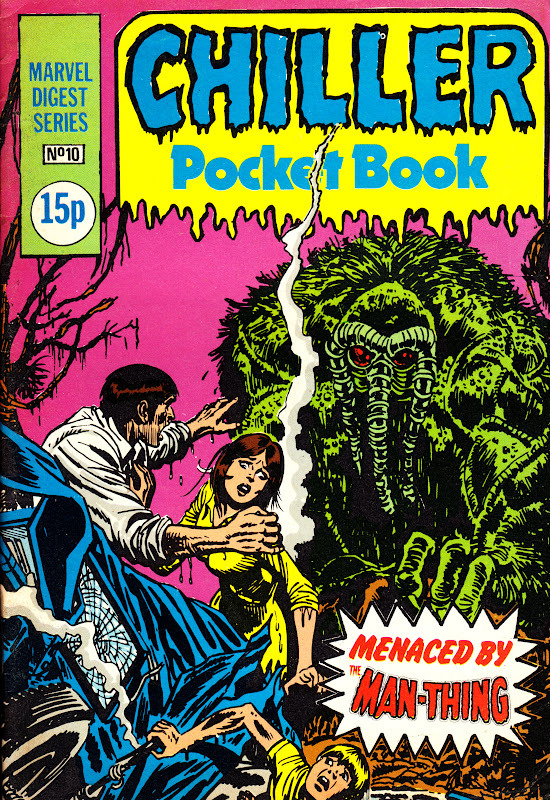 Horror strips including THE TOMB OF DRACULA, MAN-THING and material from the US horror comic and magazine lines. Issues 9 & 20 were double-length. 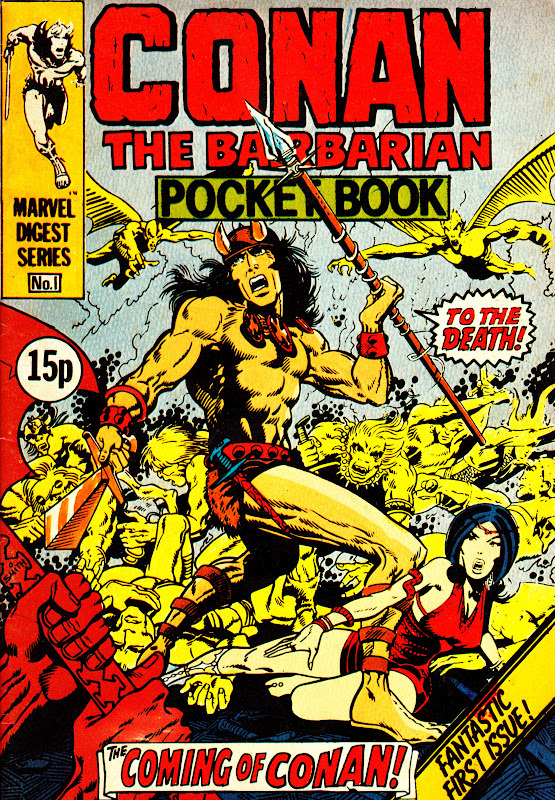 Conan reprints from US CONAN THE BARBARIAN issue 1 onwards. This material had previously appeared in the UK in SAVAGE SWORD OF CONAN (Volume 1), 1975. Conan strips also ran in THE SAVAGE SWORD OF CONAN (volume 2) and VALOUR (latterly FUTURE TENSE AND VALOUR) during this period. Reprints from US THE FANTASTIC FOUR 43 onwards. 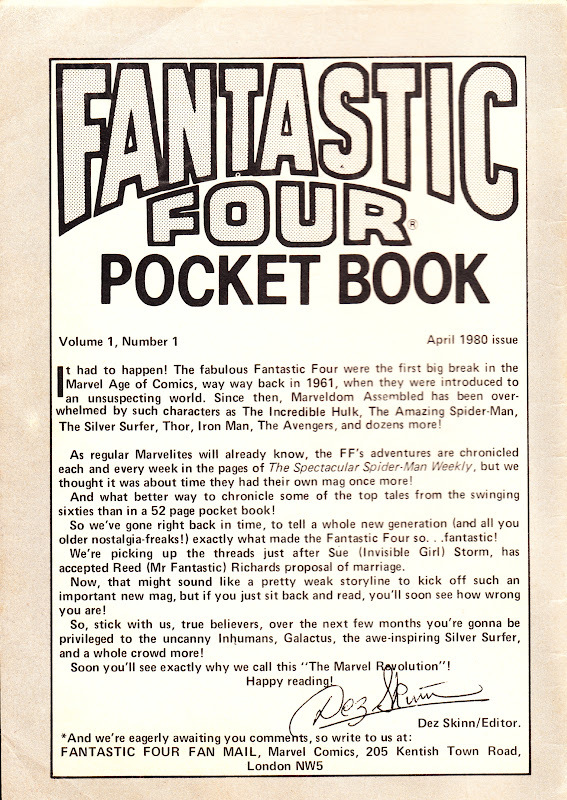 The FF had previously had a solo run in THE COMPLETE FANTASTIC FOUR (53 issues) from September 1977. 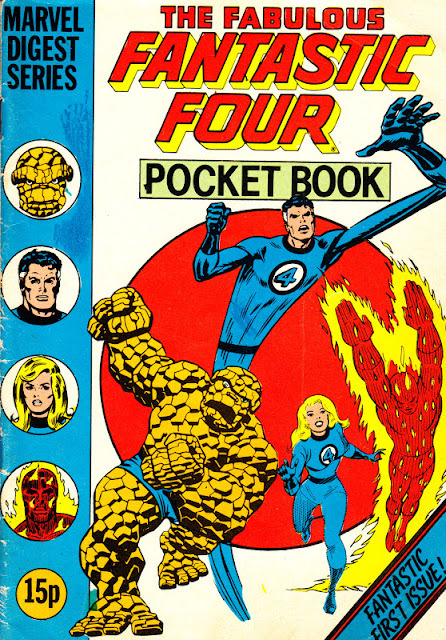 More contemporary FF reprints were also appearing in MARVEL TEAM-UP (1980), MARVEL ACTION (1981) and CAPTAIN AMERICA (1981) during this period. The foursome graduated to their own weekly (29 issues) from 6 October 1982 - 20 April 1983. 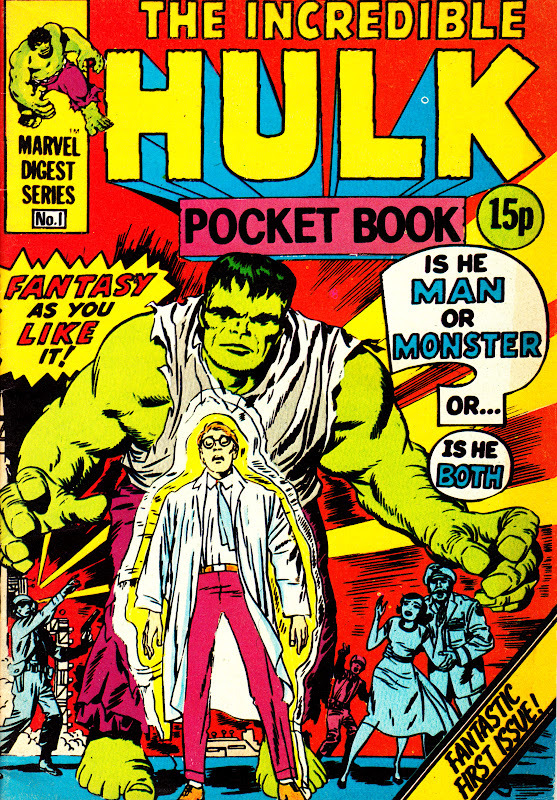 Reprints from US THE INCREDIBLE HULK issue 1 onwards. Previously reprinted in THE MIGHTY WORLD OF MARVEL (volume one), 1973. The Hulk's popularity was bolstered during this period by the Universal live-action TV show. The Green Goliath also appeared in HULK COMIC, SPIDER-MAN AND HULK WEEKLY and RAMPAGE MONTHLY during this period. 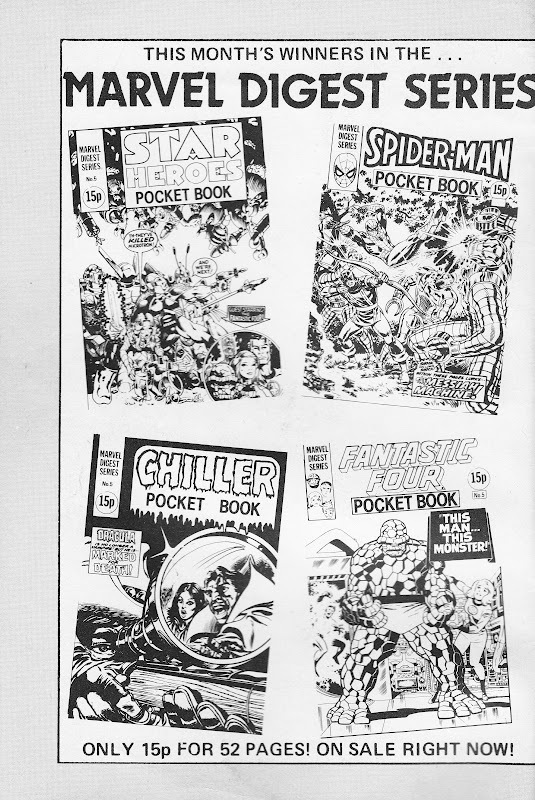 Initially a venue for MARVEL TEAM-UP reprints, these strips were swiftly diverted to the new weekly of the same name, replaced here by sixties Spider-man reprints beginning with US AMAZING FANTASY 15. 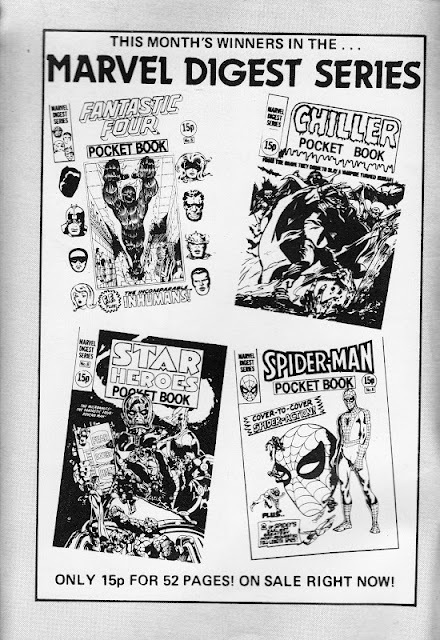 Despite Skinn's request for mail (above), none of the Pocket Books range ever featured a letters page. Spider-man also appeared in SPIDER-MAN weekly and MARVEL TEAM-UP weekly during this period. The Spider-man reprints continued briefly in THE DAREDEVILS, 1982. 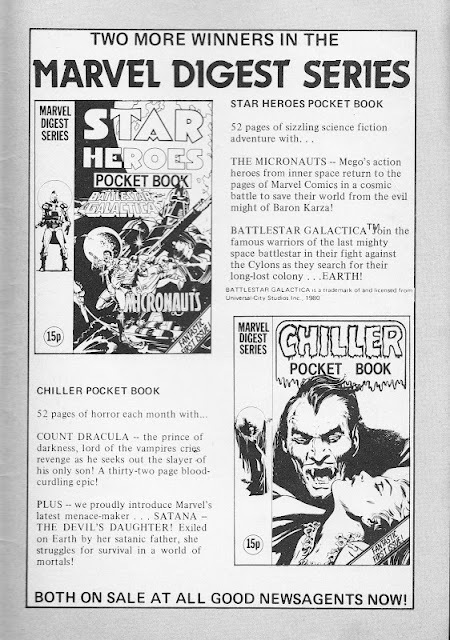 Piloted with (the standard-format) STAR HEROES WINTER SPECIAL 1979. 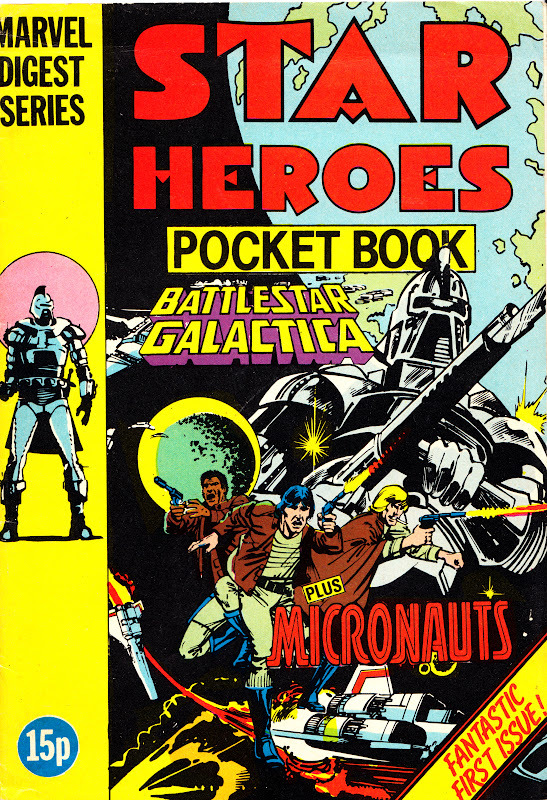 Contemporary reprints of the TV-based BATTLESTAR GALACTICA and toy-based THE MICRONAUTS. Episodes of BATTLESTAR GALACTICA (1978-79) were initially reworked as feature films in the UK. The TV series did not debut until September 1980 (with some ITV regions airing it considerably later). A 'rival' Battlestar strip also appeared in LOOK-IN weekly during this period. 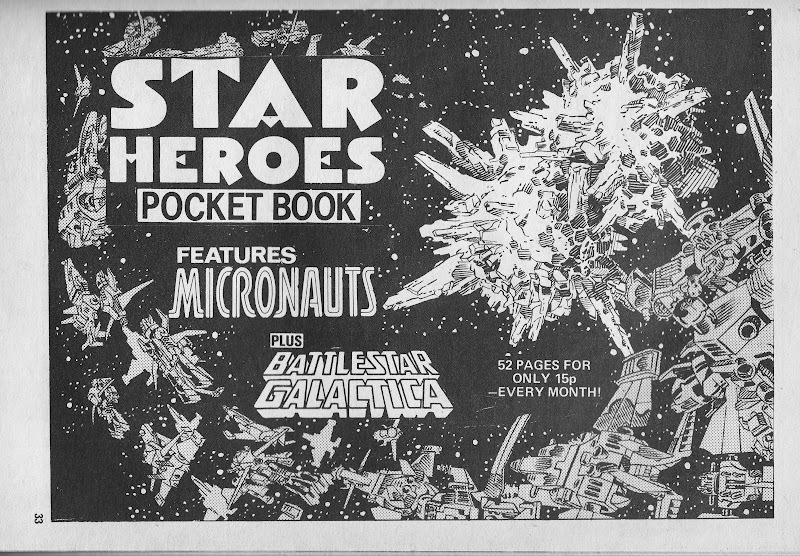 THE MICRONAUTS had initially appeared as a back-up strip in STAR WARS WEEKLY. They would appear next in FUTURE TENSE (1981). Original X-Men strips, beginning with US THE UNCANNY X-MEN 1, were added from issue 10. 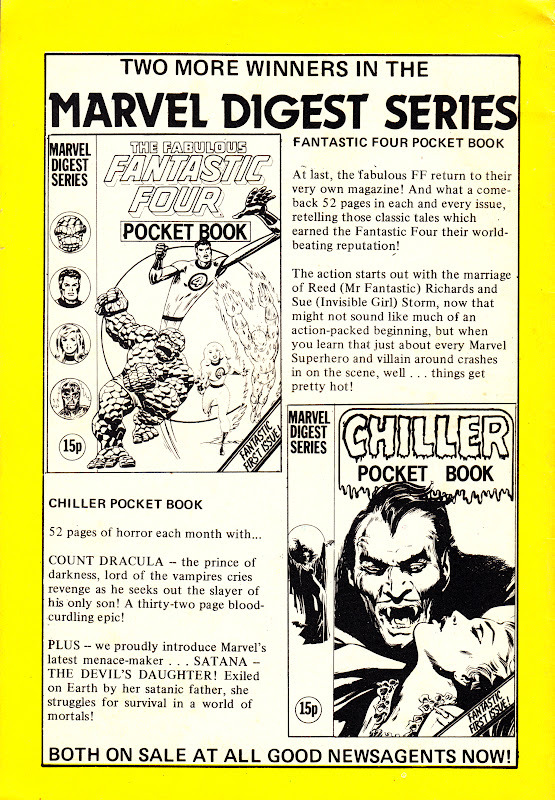 Becomes X-MEN POCKET BOOK from issue 14. 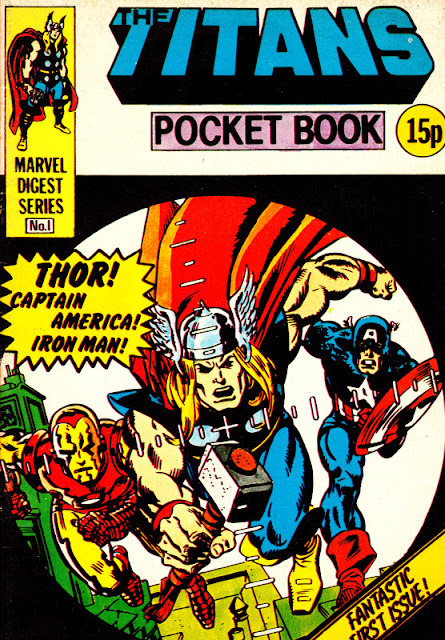 Avengers-centric sixties reprints of Captain America, Iron Man and The Mighty Thor. 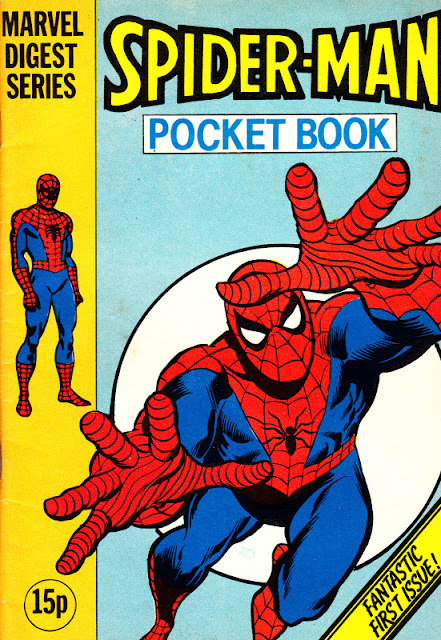 TITANS was previously a landscape-format weekly (coining the description "Titans format") published for 58 issues between 25 October 1975 and 24 November 1976, merging with SPIDER-MAN from 199. Issues 1-13 published as STAR HEROES POCKET BOOK. 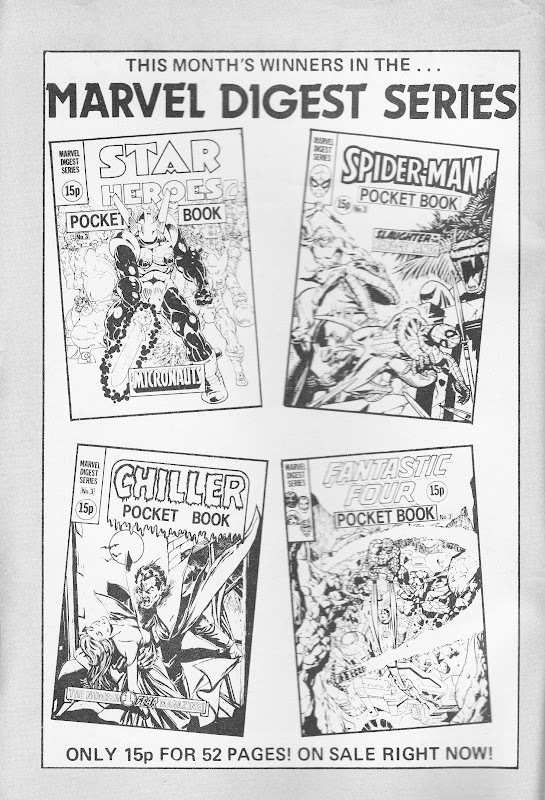 Issues 14-28 as THE X-MEN POCKET BOOK. X-Men reprints began to appear from issue 10, with the covers redesigned (see above) to prepare for the change of title. X-Men reprints began from US THE UNCANNY X-MEN 1. 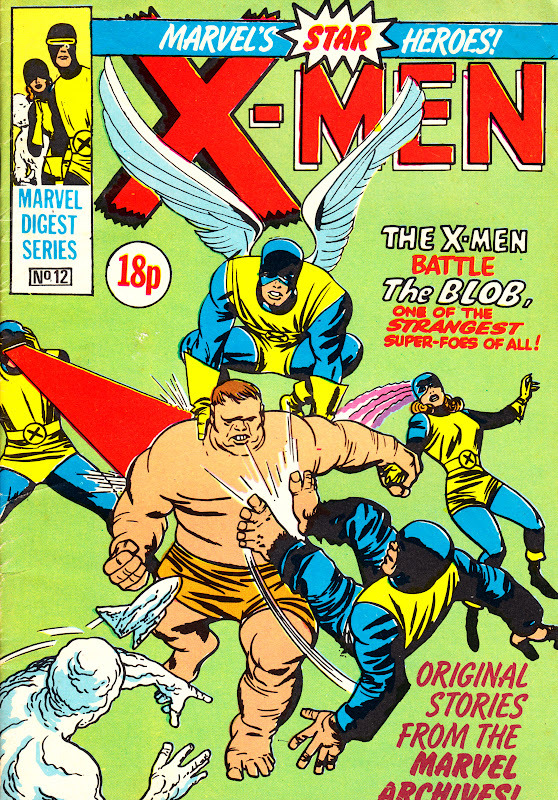 The same material, albeit in colour and at a larger page size, would appear again in 1983 in X-MEN weekly. 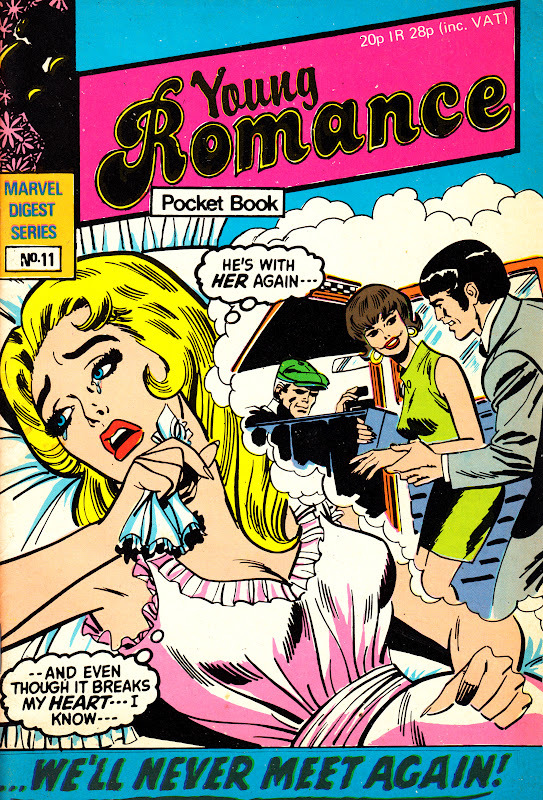 Classic Marvel romance strips, presumably pitched at a female audience (making it a rarity amongst Marvel UK's output of this period). 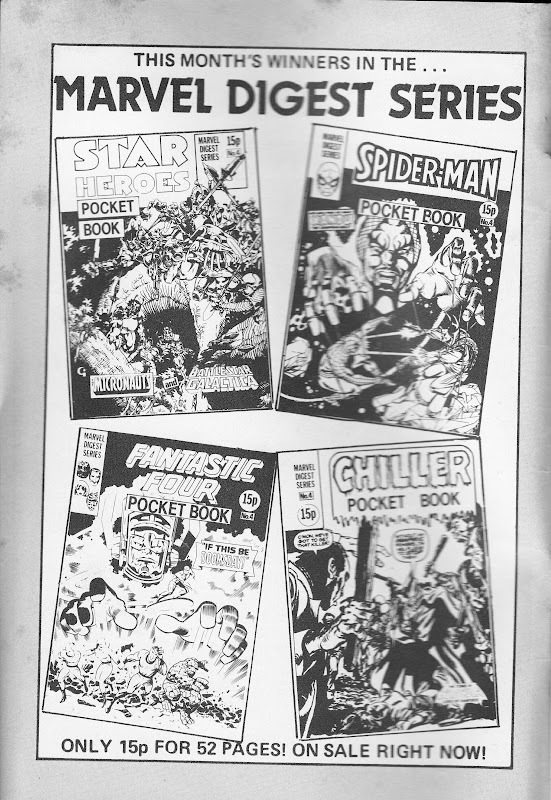 Enjoyed seeing the old covers and your thorough analysis (both of this and other Marvel UK output covered on the blog). Great stuff. One very minor correction - I believe "Complete Fantastic Four" ran 37 issues before moving into Mighty World of Marvel just before MWOM #300. Keep up the fine blog work. The Titans may have been Avengers centric but an Avengers digest would have got 15p of my money any day.